Freshman Jake Gunning will represent Buffalo as the No. 3 seed in the heavyweight division for this weekend's MAC Tournament. The Buffalo wrestling team experienced a bit of a renaissance this season. It claimed its first conference victory in more than two years and first 10-win season since 2003-04. After sitting out last season’s postseason due to an Academic Progress Rate (ARP) ban, head coach John Stutzman believes he has the team, led by a talented group of underclassmen, on the right track. Now, he’s ready to see the results first-hand. Stutzman says his team is “nobody’s pushover,” despite its struggles in year’s past. The Bulls (10-9, 2-6 MAC) will send 10 wrestlers to Ypsilanti, Michigan to compete at the MAC Championships this weekend. Kyle Akins (125-pound), Bryan Lantry (133) Brandon Lapi (141), Colt Cotton (149), Alex Smythe (157), Rrok Nkodaj (165), Muhamid McBryde (174), Joe Ariola (184), James Benjamin (197) and Jake Gunning (285) are the Bulls’ representatives at the tournament. The most prolific wrestler Buffalo will send is Gunning, who is the only top-three seed the Bulls will offer. He will wrestle at 285 lbs., which is in the heavyweight division. Just prior to the final practice before the MAC Tournament, Gunning took a moment to soak in the moment. There’s a chip on his shoulder. This will be his first MAC Championships. He won’t admit that maybe he’s being underestimated, but expressed confidence heading into the weekend’s event. Gunning may be the No. 3 seed in this weekend’s championships, but if it were up to him, seeding wouldn’t matter. The MAC, which includes four nationally ranked teams including No. 6 Missouri and formerly ranked teams Old Dominion, Northern Iowa and Northern Illinois, is one of the best conferences for wrestling in the country. While the Bulls don’t tout elite talent, some of their younger players have made strides, but are not entirely at elite level just yet. Of all the weight classes Buffalo will participate in at the MAC Championships, only Gunning ranks in the top five in his weight class. Eight of Buffalo’s 10 competitors are ranked seventh or lower. Akins is the only other wrestler ranked higher than No. 7. He is going into the championships as a No. 6 seed, but he may be the most prolific six-seed in the entire championships. Along with Gunning and Stutzman, Akins said he is ready for the moment. The 125-pounder, formerly ranked No. 33 in the nation just a couple weeks ago, wants to make the MAC Championships his moment, both for him and the program. The turnaround was made with his attitude around the program. National prominence is on the mind for this team and members believe the national spotlight will come sooner than later. It’s possible this weekend could begin the national exposure. Gunning acknowledges the program has never been that great outside of a few individuals, but he thinks they should be the best team that UB Athletics offers. And the Bulls could use that moment beginning on Friday to take the program a step forward. With several successful underclassmen on the roster performing and succeeding early, the Bulls could possibly reach the top of the conference in a few years. For Stutzman, this could be the moment that starts it all. Michael Akelson is a sports staff writer. 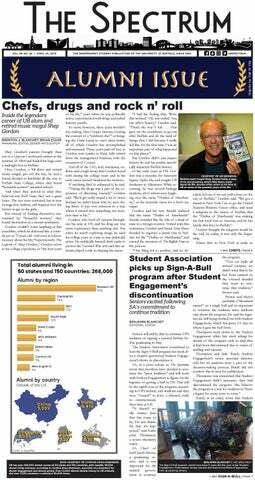 Sports desk can be reached at sports@ubspectrum.com.